Weeks ahead of French President Emmanuel Macron's upcoming visit to Egypt, a forum was held in Cairo on Monday to discuss French-Egyptian strategic partnership in the health sector. The forum, which was organised by Al-Ahram Hebdo in partnership with the French Embassy in Egypt, was attended by Egyptian Minister of Investment Sahar Nasr, Minister of Health Hala Zayed, French Ambassador to Egypt Stephane Romatet, and the head of Al-Ahram institution Abdel-Mohsen Salama. Romatet said during the opening ceremony that "we believe Egypt is looking forward to working on renovating the health sector, general health, obesity, cancer treatment, and pharmaceutical industries…What we want to offer to you is a strategic partnership in this field." Egypt is currently working on a high-profile plan to improve health insurance coverage for the public. A new public health insurance law, which was ratified earlier this year by Egyptian President Abdel-Fattah El-Sisi, is designed to provide optimal medical services for the whole nation. The country's health insurance law, which dates back to 1962, stipulates that everyone should be covered by health insurance, but over the years the system has lost its effectiveness, pushing many to forego the system in search of better quality healthcare. "French investing companies are here because they are showing interest in investing in this sector," Romatet said. Egypt's minister of investment highlighted her ministry's efforts to encourage foreign investors to invest in Egypt. "I am here to show interest in negotiating with French investors … we are looking forward to implementing projects that would serve the interest of the Egyptian citizen, which is currently the top priority of the cabinet's agenda," Nasr said. The investment minister highlighted that Egypt is keen to learn and benefit from the French expertise in the health sector. "All international institutions are keen to support Egypt's national health plan, including the International Monetary Fund," she said. The minister further stressed that "we have made all efforts to remove all obstacles that were facing investors." Health Minister Zayed said that the ongoing meetings with a French delegation are discussing strategic partnerships in the new national healthcare system, as well as other domains in the health field. The delegation, which comprised 13 individuals, was headed by Lamine Gharbi, president of the Federation of Private Hospitals (FHP) and president of the MEDEF International Health Task Force. MEDEF is the largest employer federation in France and offers healthcare in more than 1,030 hospitals in the country, according to MEDEF's website. "We are currently discussing how French companies could work with the Egyptian government as consultant firms concerning the healthcare system, such as in e-health and technology. We have also discussed hospital management, and the biggest project for us is manufacturing plasma," Zayed said. The health minister also announced that an agreement will be signed in January between the two countries in the health sector. During three roundtables, participants discussed universal health insurance, future reform of the pharmaceutical sector, French expertise in the integrated health system, and approaches to improving healthcare through French expertise. Last year, France granted Egypt a loan of 30 million euros to improve the primary healthcare system in several Egyptian governorates. Aid to the health minister Ahmed El-Sobky told Ahram Online that French partners have already started partnering with Egyptian various ways. "We have more than one framework with the French side; the first is concerning the manufacturing of plasma. French companies are expected to help us on both the advisory and the executive levels of this project," said El-Sobky, who added that the second domain is manufacturing pharmaceuticals. "There is currently cooperation with the French Development Agency (FDA), which is a representative of the French sides in the new universal health insurance system. [The FDA is already providing] technical and financial support through grants that are being offered to develop primary healthcare in Port Said," says El-Sobky. The last domain was the development of emergency rooms, where Egypt and France are planning to exchange expertise. 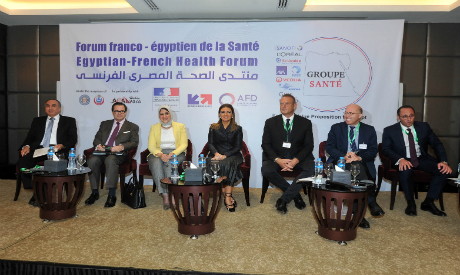 Experts, business leaders, and Egyptian and French decision-makers participated in the forum, including general manager of the Saint-Joseph Hospital Group and Special Advisor to the French MFA on International Health expertise Jean-Patrick Lajonchère.